Onsite Parking is FREE. There are two lots. 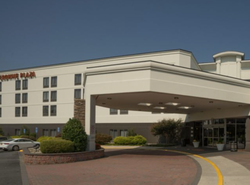 Driving or flying to IAD and taking the Hotel's free shuttle are the easiest ways to travel. For those who want to take trains and buses, check out the information here. 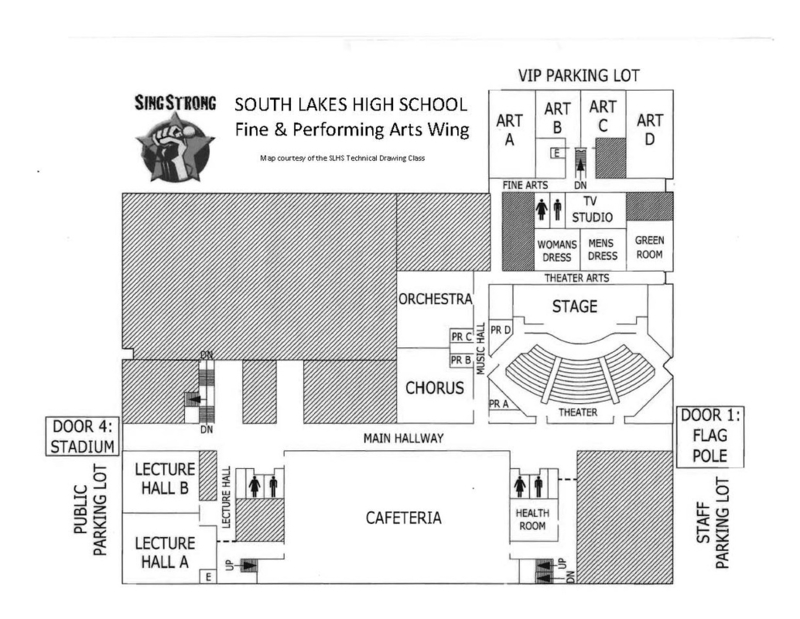 South Lakes Dr and Seahawks Dr is the intersection where the South Lakes HS Arts Center is located and where all concerts and classes occur. The bus stop at South Lakes Dr and Soapstone Dr is 3 blocks West of this location. A taxi from Union Station to Reston, VA will cost approximately this much and take approximately 1 hour. Time and cost estimates will vary greatly in heavy traffic. Guests stay here, at this fantastic Hotel -and the Friday and Saturday Afterglow Parties take place here as well! Onsite Parking is FREE. Shuttle to IAD and SingStrong Classes and Concerts is FREE for guests. just off Sunrise Valley Drive, in Reston, Virginia. 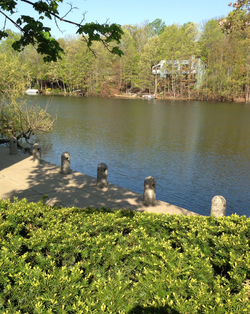 It's situated on beautiful Lake Thoreau. Though we offer food onsite at SingStrong, this nearby location offers more diverse food options, especially useful for those with special food needs. Directions: Just make a left out of the HS onto South Lakes Drive and the center will be on your left in 1 mile. Map. Driving takes under 5 minutes. Walking takes about 17 minutes. Food and other stores located in the Center. SingStrong offers a packed schedule so consider calling ahead to the store or restaurant of your choice for delivery or pick-up. Fly into Dulles International Airport (IAD). It's only 10-15 minutes away! And for guests of the hotel, there is a FREE Shuttle to pick you up and bring you to the hotel . You could also fly into BWI, but it is approximately an hour away, and taxis are expensive. See FAQ for more details. Will-Call, Tickets, classes and concerts are close to DOOR 1. Do NOT enter through Door 4. 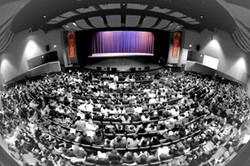 Sat and Sun Classes take place in CAFETERIA, CHORUS, STAGE/Main Theatre and other rooms as noted on the schedule. The FREE Shuttle has been instructed to pick-up and drop off at Door 1.